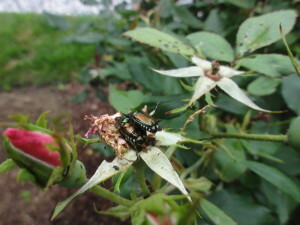 The Japanese Beetle has a complex life cycle that is complete in about a year. 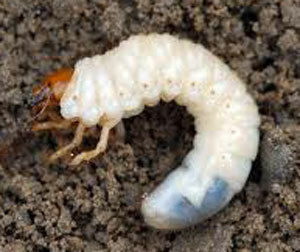 Evidence of a problem would be the appearance of the larvae (small white grubs) in your soil (garden and turf). Beetles in our area begin emerging in mid June and peak in early July. They remain active for 4-6 weeks. Adults feed in the daytime. You may first notice the damage to leaves that appear skeletonized because the pests eat leaf tissue between the veins so the foliage looks like lace. They devour leaves as well as flowers. The adult beetle is just under 1/2 inch long, with a shiny metallic green body and bronze-colored outer wings. The adults lay eggs through July or early August. The beetles remain close to the emergence area, and lay their eggs (40-60 each) near their feeding site. The eggs hatch in about 10 days and grubs begin feeding on grass roots during August and early September, sometimes extensively damaging turf grass before moving down about 6-18 inches into the soil where they remain inactive until spring. In late March or early April, they return to the surface and briefly feed on roots. During late May, they stop feeding, pupate and emerge as adults in June. You will be most successful at attacking the problem if you identify and remove the beetles as soon as possible once they appear. They tend to start eating at the top of the plant and work downward. While unsightly, and potentially extensive, the plants affected are not usually otherwise harmed. dropping them into a bucket of soapy water (or quickly knocking them into the bucket before they can fly away). 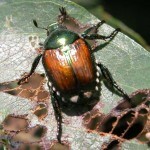 This is particularly effective when activity is low, because the presence of beetles on a plant attracts more beetles. 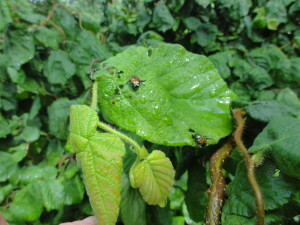 When you remove them daily, you limit the numbers of new beetles that will be attracted to the plant. Do this in early morning when they are sluggish. If you prefer to use chemicals, insecticides (e.g., Sevin) are effective; however, this approach is discouraged because such chemicals also kill beneficial insects (i.e., pollinators and those that prey on other insects that are harmful to plants). For plants that you know are typically attacked, it can be effective to spray them in advance of infestation with Neem oil (or other products labeled for this purpose). Repeat sprayings will be needed over the several weeks of activity. Be vigilant in looking out for them. 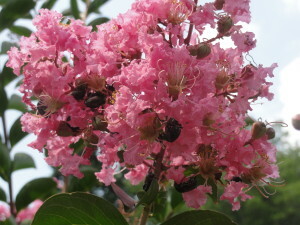 Plants that I have seen badly affected include Rose, Crapemyrtle, Fig, Rose of Sharon, Witchhazel, Harry Lauder’s Walking Stick, and a variety of flowering perennials mostly in sunny areas. Baited Japanese Beetle traps are not recommended for effective control (but can be useful to assess the existence of a problem). Frequently, a single trap attracts beetles from an entire neighborhood, increasing the damage to the site around the trap and damaging adjacent plants that might not otherwise have been affected. Finally, if high grub populations are found in the soil around turf grass (easily assessed in early August), lawn insecticides can be applied. In the past, the neonicotinoid, Imidacloprid, was the most effective solution; however, this systemic substance has been linked to injury to honeybees and, therefore, is not recommended. A newer class of chemical, Acelepryn, has very low toxicity. This should be applied in August to be effective. Keep in mind that lawns stressed by drought are most susceptible to grub damage. Some people have good results with milky spore, an organic approach, albeit a time-consuming one. A full understanding of the life cycle and environmental conditions is helpful for control. 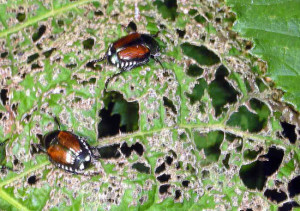 Since moist soil makes it easier for grubs to move down into the soil, where they overwinter, a particularly wet summer is a good predictor of high grub populations and thus Japanese Beetle activity the following summer. Since the summer of 2013 was very wet, it is no surprise that the summer of 2014 is turning out to be among the worst in recent history for Japanese Beetles. Take action now, and be prepared next summer. Grub damage to turf in the form of patches of browned turf is an indication that treatment would be useful at this time. Photo credits: above, top to bottom: (1) Purdue University Extension; (2) www.greenthinking.ca; (3) hyg.ipm.illinois.edu.